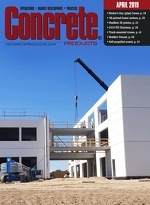 After a second consecutive year where concrete, cement and aggregate interests saw modest shipment gains--while overall construction industry increases in 2013 reached the 7-8 percent range--producers are positioned to act on plant and fleet equipment investment carrying them through the growth phase projected for the remainder the decade. Concrete producers attending ConExpo-Con/Agg 2014, March 4-8 at the Las Vegas Convention Center, will note compressed natural gas-powered front and rear discharge mixer trucks; new mixer- and dump-ready Class 8 models; mobile device-geared fleet tracking and management technologies; and, new plant offerings ranging from portable roller compacted mix or small capacity, transit mixed models--to name a few of the innovations in store, particularly in the South Hall. Association of Equipment Manufacturers bills the show as an immense unveiling of all the newest equipment, technology and product breakthroughs for the concrete, aggregate and construction interests. From earthshaking big iron to groundbreaking innovations, it's all assembled in one place to help attendees work smarter. ConExpo-Con/Agg 2014 will cover a record-breaking exhibit expanse exceeding 2.3 million net sq. ft. of indoor and outdoor booths, while the co-located IFPE 2014--targeting the fluid power/power transmission/motion control industries--marks a record 165,000 net sq. ft. of exhibit space. "Attendees will find the newest products and technologies and technical experts ready to discuss product features and applications. In the space of a few days, in one place, visitors can examine and compare the best of what our industries have to offer," says Megan Tanel, ConExpo-Con/Agg show director and AEM vice president exhibitions and events. "Attendees will also find the focused industry education, with the latest techniques and information, they need to run their businesses most efficiently. The opportunity to share experiences and ideas with industry peers adds another dimension to the show experience," adds Melissa Magestro, IFPE show director and AEM senior director, Exhibitions. ConExpo-Con/Agg 2014 organizers project: a) 2,400-plus exhibitors showcasing new products and technologies for every major construction segment, including concrete, aggregates, asphalt, earthmoving, lifting, mining, and utilities; b) more than 130,000 attendees that range from contractors, to dealers and distributors, to service providers, engineers, producers, municipalities; and, c) a comprehensive education program during the five-day exposition with sessions emphasizing industry issues and trends, management and applied technology.